The Woods rustic sheet set is a colorful adaptation of northwoods icons set on a block pattern background on the top sheet in colors that include red, brown, blue honey and cream. Bottom sheet is a large navy and cream check. Made in the USA. 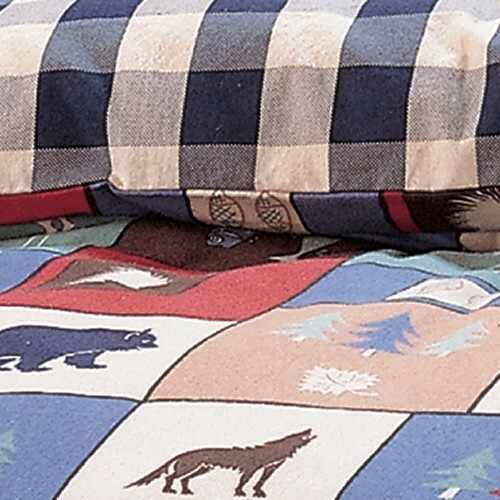 The Woods rustic sheet set is a colorful adaptation of northwoods icons set on a block pattern background on the top sheet in colors that include red, brown, blue honey and cream. Bottom sheet is a large navy and cream check. Reversible pillow cases have a bear on one side and moose on the other. Made of 50% cotton and 50% polyester percale. Usually ships in 3-5 business days. Made in the USA.